Hold on to your hat! “Les Soldes d’hiver 2012″(big winter sales) in Paris will kick off on Wednesday, January 11th, and last through Tuesday, February 14th. 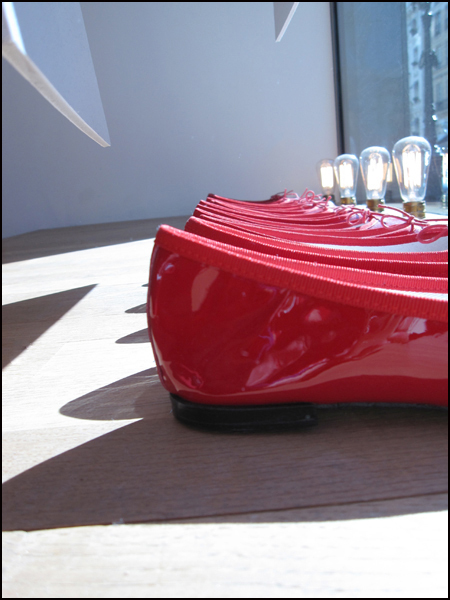 Pining for a pair of discounted Repetto ballet shoes? Well then, it’s high time to shine, and make a plan of transaction. Here are a few suggestions and addresses, so crank up your printers! Oh, my. I spy. Strategize like there is no tomorrow. Visit your favorite shops prior to the sale. Memorize the layout. Take note of “rack formations.” Also, know your European shoe sizes. If the shoe fits, jot down its size, model and color. Create a wish list. Then on the first day of the big sales, arrive early with a “quest” in mind and a list in hand. 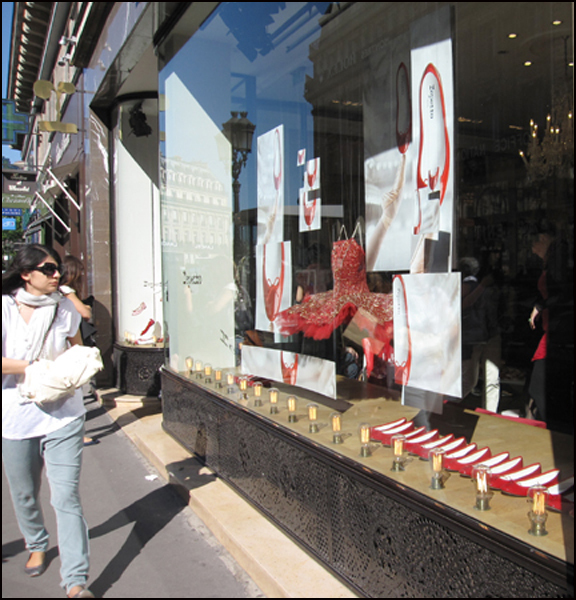 My favorite Repetto shop is located at 22 Rue de la Paix, just a hop, skip and pirouette from the Opéra Garnier. Swing by for a peek at the historic flagship’s towering cubbyholes, stuffed with satin ballet slippers in every shade of pale. There are also Repetto shops at 51 rue des Francs Bourgeois (Métro Saint Paul), 51 rue du Four (Métro Saint Sulpice), and 36 rue de Passy (Métro Passy). Printemps and Galeries Lafayette on Boulevard Haussmann also carry the iconic flats, plus limited-edition models made specifically for the grand magasins. Dreaming of rodeo booties or flats made of faux animal prints? Giddy-up! Embrace your inner Annie Oakley. Again, arrive early for the trapping. Rose obliged her with a sublime pair in red (and the rest is history in the shaking). Talk about shaking, Mick Jagger and Serge Gainsbourg rocked out in their own Repetto versions of lace-up oxfords. Oh-ra-ra! Is Jimmy Choo on sale in Paris now? Great Q! I’ll score the Jimmy Choo shoe scoop for you. Stay tuned. Then I realized they were tiny ballet slippers! It made me laugh . . . . I know. I know!! It’s dangerous. . . T.